The reports made by our industry examiners are dependable and have been inquired about and approved from a few essential and optional assets. What makes us interesting is the way that alongside showing an investigation of the market's verifiable and present situation, we additionally exhibit an estimate survey of the market for the advantage of our peruser. The introduction is remarkable as different graphs, tables, and outlines. All of data show in the market examine report is one of a kind. Master suppositions are likewise present in the report that can be straightforwardly utilized by the perusers to settle on future choices. Host cell proteins essentially refers to the heterogeneous group of proteins that are derived from host cells such as yeast, E-coli, and mammal, among others. They differ largely form each other in terms of properties, isoelectric point, and molecular mass. Identification and quantification of host cell contaminants is very important in the development of biopharmaceuticals. A range of techniques are used for identification of host cell contaminants, for instance, immuno-specific techniques such as ELISA, Western Blot, PCR, and non-specific techniques such as electrophoresis and LC-MS. In general, semi-quantitative or quantitative methods are used for sample purification. However, during the biopharmaceutical development, an ideal method is required to identify all kinds of host cell contaminants with high throughput, and quantitative analysis. Among all end users of host cell contaminant testing, the global market is expected to be led by bio-pharmaceutical companies. 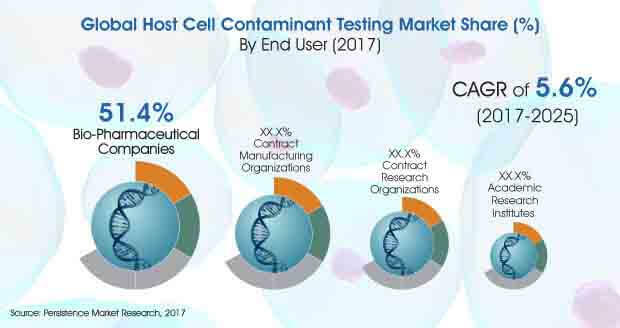 It accounted for a share of 51.4% of the global host cell contaminant testing market in 2017 and is expected to maintain a dominant position in the market over the course of the forecast period. Many pharmaceutical companies epitomize several prominent connections in the chain of pharmaceutical development, as they have the economic strength and drug manufacturing experience needed to introduce novel drugs into the market. Additionally, they have production capabilities and necessary market infrastructure required for a product to reach the desired marketplace. Thus, several nascent biopharmaceutical companies depend on partnerships and agreements with large-scale pharmaceutical companies in order to finance, enhance their customer base, make expensive products, conduct clinical trials, and market their products. Equally, almost all large-scale pharmaceutical companies are in incessant need for new, effective, and advanced therapeutic techniques and are also know that it is not possible to generate everything in-house. Thus, bio-pharmaceutical companies investing on host cell contaminant testing are entering into partnership deals. As with investors, the companies are striving to manage and moderate risks, thus giving precedence to low-risk, and late-stage products such as antibodies and small molecule drugs. Meanwhile, the early stage host cell contaminant therapies only occupy a small amount of the deal values and deals. Many bio-pharmaceutical companies are yet to venture into the cell contaminant testing space. Contract research organizations are likely to give a tough competition to contract manufacturing organization in the years to follow. New investments into a company tend to dilute the existing investors as now they have a comparatively small slice of a large pie. However, there are other ways to finance drug development without causing harm to the present group of investors. They can have a definitive agreement as a contract research organization or a contract manufacturing organization with leading companies for a certain tenure. Contract research organizations and contract manufacturing organization identify the target disease, do a pre and post-clinical evaluation, conduct a toxicology and safety test, and clinical trial design and implementation. Same is with contract manufacturing organizations that manufacture certain specific drugs with specific requirements with their relevant equipment required for the specific type of drug manufacturing.